The following content includes referral links and/or PR samples (*). Read my disclosure policy for more info. Raise your hand if you’re excited about spring! Truth be told, we didn’t have too much of winter this year, and recently, the weather has been just so beautiful, warm and… uplifting. While usually, it seems like the winter is dragging its feet, this year, at least to me, it seems like it flew by. 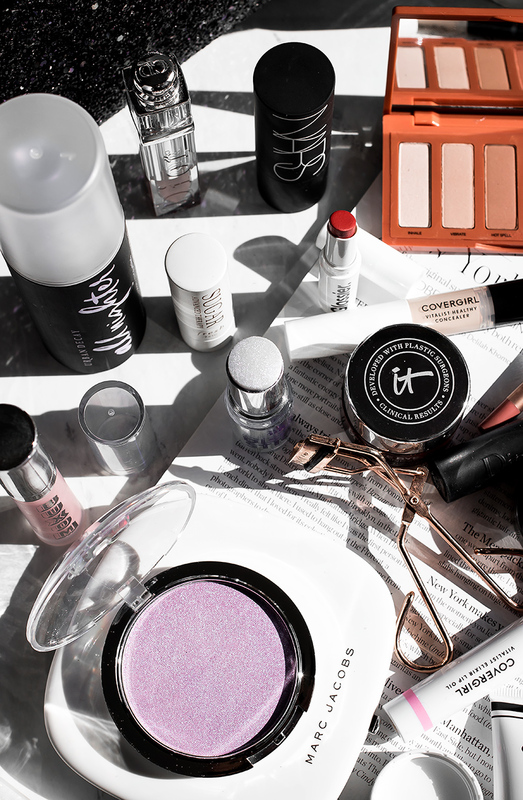 I love seeing more sunshine, warmer weather and there’s just something about this time of year that makes feel more excited about wearing makeup. 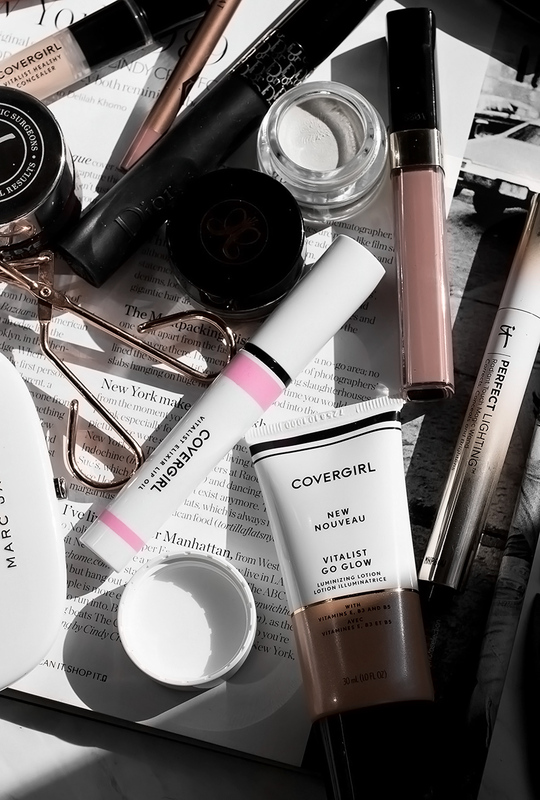 So, this month in my bag, there were a few older, but beloved products that are in constant rotation. Glossier’s Generation G sheer lippie in Poppy– there is just something about sheer lips that screams “spring!” to me. This universally flattering shade is just so pretty and love the sheer, comfy formula that isn’t too drying on my lips. I love seeing drugstore brands stepping up their game. Covergirl came out with the Vitalist Collection and one of the products I’ve been most excited to try was the Go Glow Luminizing Lotion*. If you love a subtle glow and the whole “glowtion” trend, this is a nice drugstore product to try. The glow that it gives is not too intense, which is nice. I gotta say I love the tube packaging as well. The Vitalist Healthy Concealer Pen*- truthfully, so far I’m not a huge fan of this concealer pen. It actually has a very nice coverage, but it just doesn’t work too well with dry skin. Yes, the glow is nice, but if you have dry skin, you probably won’t be thrilled with the fact that the product tends to settle into lines and accentuates any dry bits. Vitalist Lip Oil*- this is actually one of my favorite products this month. I tried two shades (Melon Granita and Cherry Crush) which have just a bit of tint to them. They have an incredibly lightweight formula, are perfect for those who like going for minimal makeup looks AND, they do not feel greasy, thick, sticky, but rather add a bit of glow while taking care of any dry bits or chapped lips. Love, love, love these- if you can find them at your local drugstore, give them a try! 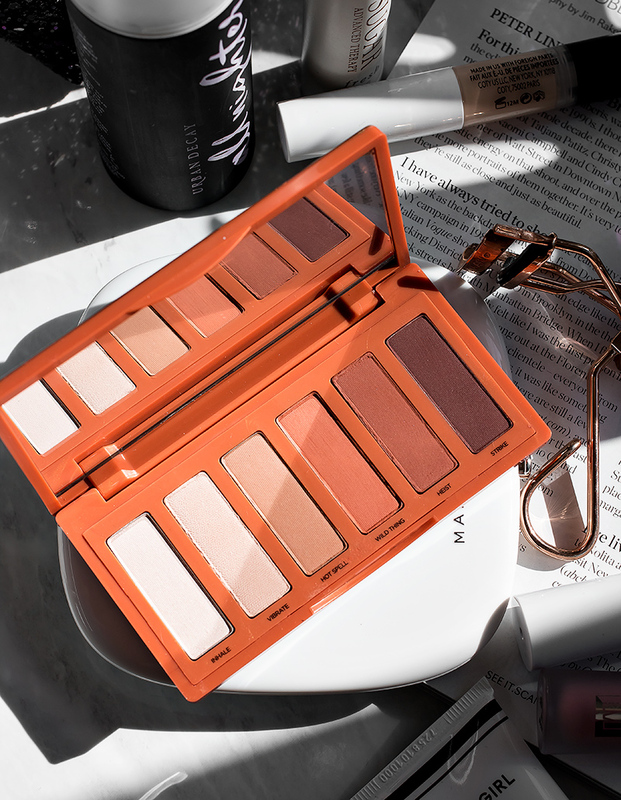 I love Urban Decay’s Heat eye palette (their Naked Palette might as well have been what made me fall in love with the brand) and this Naked Petite Heat palette features all new shades inspired by the original Heat Palette. This little baby is perfect for creating both daytime and evening looks. It has five matte and one demi-matte shade- as always with UD eyeshadows, the quality is amazing. I don’t think that this palette is particularly unique and a lot of these shades can be easily duped, but the nice thing is that most of these will work really well with other palettes in my collection. If you already own the Naked Heat, you probably won’t find anything particularly unique about this one, although I’m I have to say kind of love it. The minute I took a look at both Urban Decay’s Holographic Disco Stick* and Disco Queen Holographic Highlight Powder* I immediately thought… wow these are gorgeous, but there’s no way I can wear them. Well, surprisingly, both of these are very easy to pull off and they’re not as intense or purple-y as you’d think. 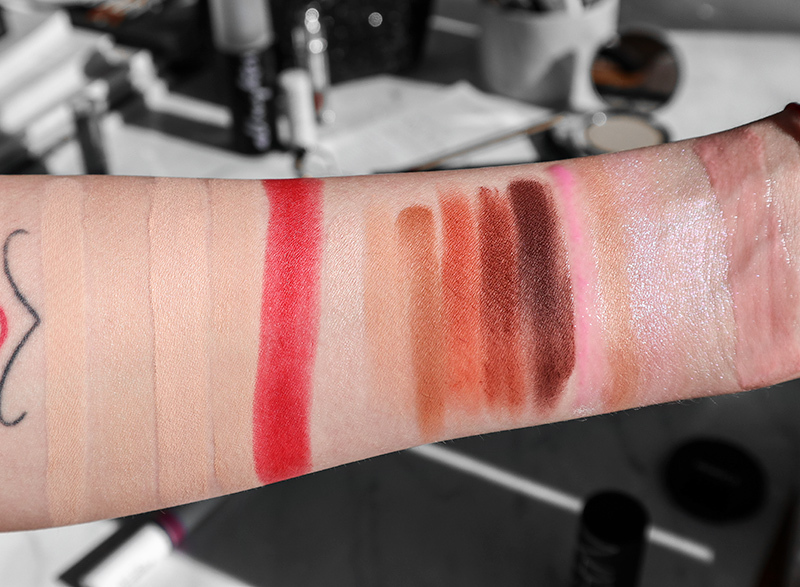 The Disco Stick is actually quite versatile and gives a gorgeous duo-chrome glow to the skin. At first, when swatching it, I thought that it’d be a bit too chunky or glittery for my liking, but once I used my beauty blender to pat it in, it ended up looking straight up stunning. Disco Queen Holographic Highlight Powder is again, a holographic highlighter that looks a bit intimidating at first. Once applied to the skin it does not look purple, but rather, it has a nice, multi-dimensional, iridescent lavender shade that when used sparingly can be pulled off even on casual/minimal looks. A nice thing about both of these products is that they can be layered on for a more intense look, or applied sparingly for a delicate glow. 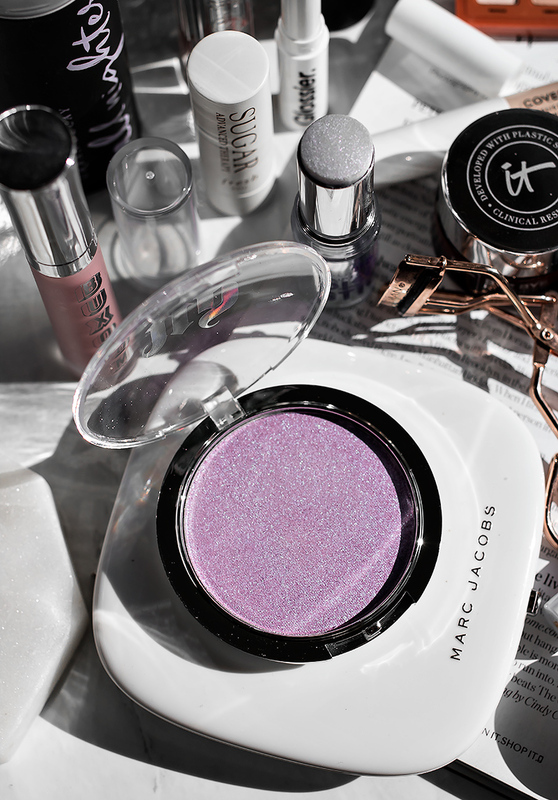 The Disco Queen Holographic Highlight Powder is definitely one I will be reaching for more during night time- the Disco Stick is a bit easier to work with your “regular” makeup looks. From left to right: IT Cosmetics Bye Bye Redness Neutralizing Correcting Cream in Porcelain Beige, Covergirl Vitalist Go Glow in #1, IT Cosmetics Perfect Lighting in Radiant Touch Magic Want in Neutral, Covergirl Vitalist Healthy Concealer, Glossier Poppy, Urban Decay Petite Heat, Covergirl Vitalist Elixir Lip Oil in Melon Granita, Covergirl Vitalist Healthy Glow Highlighter in Moonbeam,Disco Queen Holographic Highlight Powder, Urban Decay’s Holographic Disco Stick, NARS The Mulitple in Copacabana, Buxom Full-On Lip Cream Polish in Pink Champagne. If you have red/blotchy skin and have yet to try IT Cosmetics Bye Bye Redness Neutralizing Cream… you are missing out. This correcting cream is incredibly concentrated and you can use it on its own (it’s super lightweight and has AMAZING coverage), you can mix it with your moisturizer for more of a sheer coverage, OR you can use this under your foundation as a base. I’m on my second jar of this stuff and it is SO good. I use the lightest shade in Porcelain Beige, which works great, I just wish that IT Cosmetics would work on creating shades that were more flattering on all skin tones (this means introducing both lighter/neutral shades and more selection when it comes to deeper skin tones). This is one of my favorite beauty brands, hands down and I love this product SO much, but even though it’s the lightest shade available, I still sometimes feel like it’s leaving me looking a bit too warm for my liking. Seriously though, if you have rosacea or other redness/blotchiness issues with your skin, this is a great product to try/sample. I am also absolutely in love with their Perfect Lighting Touch Magin Wand (I use the shade Neutral). It blends in beautifully and adds a nice glow to your under-eye area. Also, a huge bonus I noticed is that unlike a lot of similar products, it does not dry out that delicate area of my skin. Are you guys excited for spring? What’s the weather like in your neck of the woods?